Although I’m thoroughly enjoying the Summer I know that in the blink of an eye it’ll be over. With this in mind I’ve got one eye on the A/W trends and ways to transition my wardrobe when temperatures can be unpredictable. Opting for darker colours reflects the changing of the season and ushers in a new phase in the sartorial calendar. Rich tones inspired by nature always look stylish and are flattering for most skin tones. Whether it’s flora or fauna, I’m instantly drawn to clothes that represent nature. 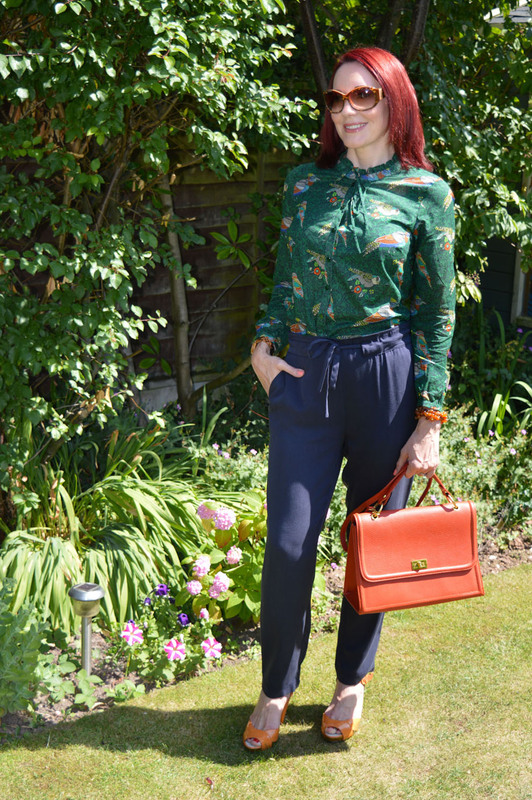 The enchanted birdies blouse and navy paperbag waist trousers are part of the Woodblock Floral end-of-summer range of smart casual daywear at Laura Ashley. 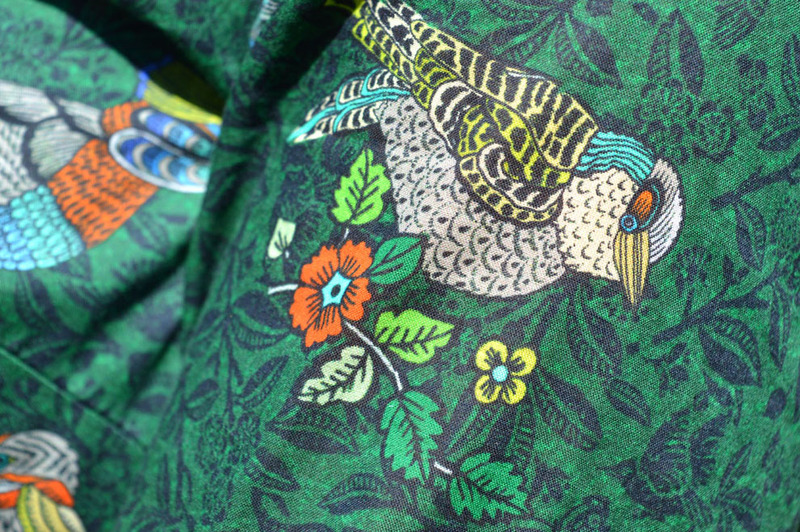 I adore the exquisite print of this enchanted birdies blouse; the forest green with accents of dark orange, turquoise, blue and yellow is stunning. Whether it’s flora or fauna, I’m instantly drawn to clothes that represent nature. In my spare time I volunteer at a wildlife hospital where I care for orphaned and injured birds, so wearing this beautiful bird print blouse feels very appropriate. The mix of colours make it really versatile – it would look great with flared dark wash jeans and platform sandals for a 70s vibe. Just add a wide brim floppy hat and a sleeveless cardigan as a topper when the temperature dips. It’s also perfect for pairing with a pencil skirt or trousers for the office. For cooler weather and air-conditioned offices a navy jacket would add an extra layer and pull the look together for a smarter option. Having a pair of trousers in classic navy that can be dressed up or down is a real wardrobe hero. The key to transitional dressing is wearing light fabrics that can be layered. This blouse is a lovely lightweight cotton while providing plenty of coverage. 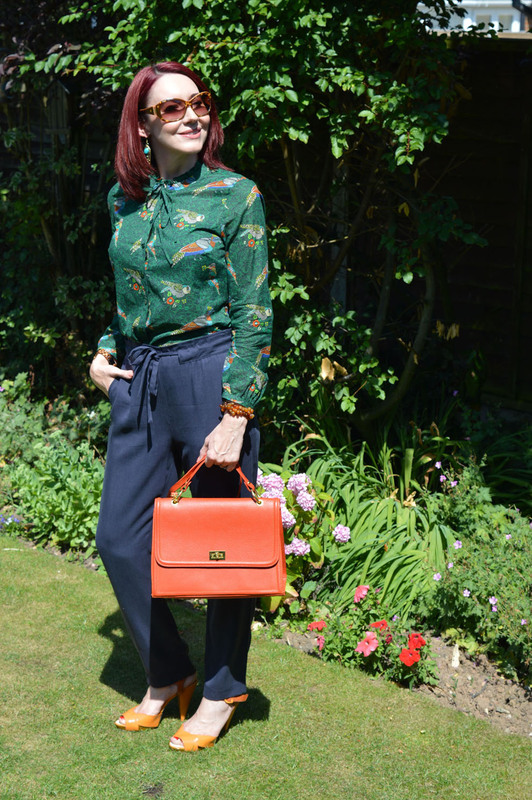 I teamed it with the navy paperbag waist trousers for a smart casual look. These trousers are so soft and feel lovely on. Plus they have deep pockets, which is always a bonus for me! What makes these trousers so comfortable is the loose cut and high waist, which has an elasticated section at the back. The tie belt can be adjusted – handy if you’ve had a big lunch! Having a pair of trousers in classic navy that can be dressed up or down is a real wardrobe hero. The burnt orange accents give a nod to autumnal hues, but the mix of colours in the print gives you plenty of options for accessorising. 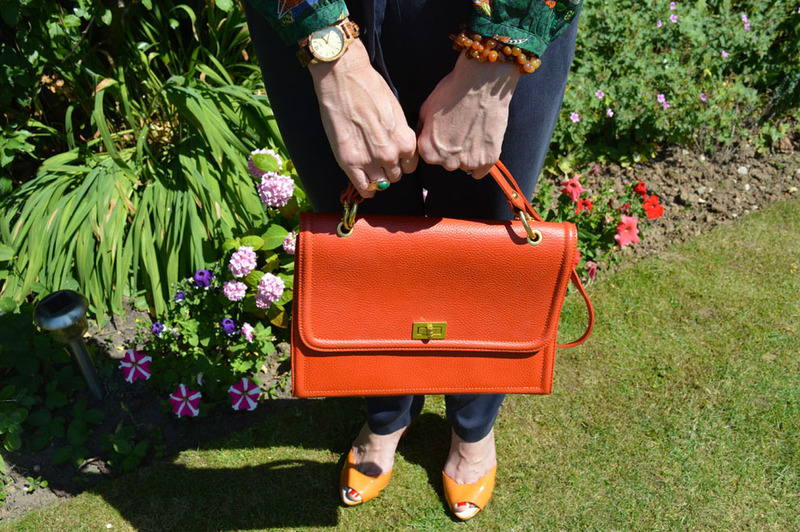 The ankle length hem begs for a bright shoe to show off so I chose a pair of orange patent sandals and bag to match. The burnt orange accents give a nod to autumnal hues, but the mix of colours in the print gives you plenty of options for accessorising. Of course, bag and shoes don’t have to match – you could mix it up with any combination of the accent colours, or simply opt for neutrals for a pared down look. 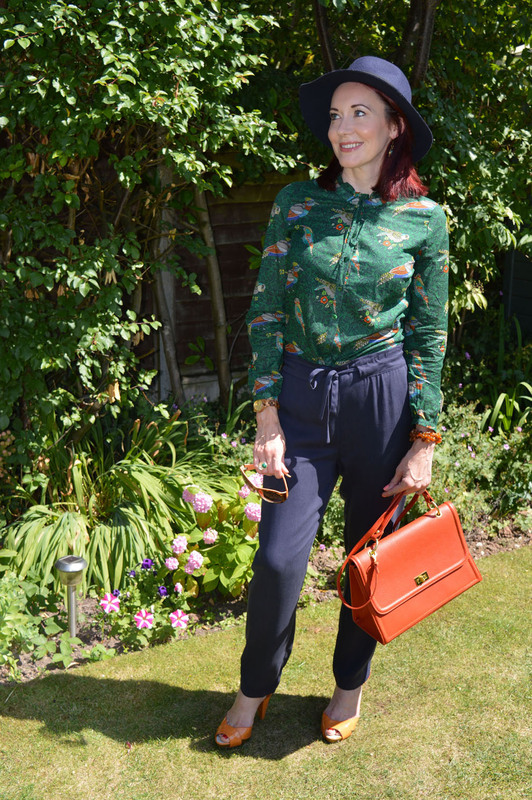 I’ve picked up on several of the colours with my jewellery, wearing a carnelian bracelet, malachite ring and earrings with a turquoise cabouchon. 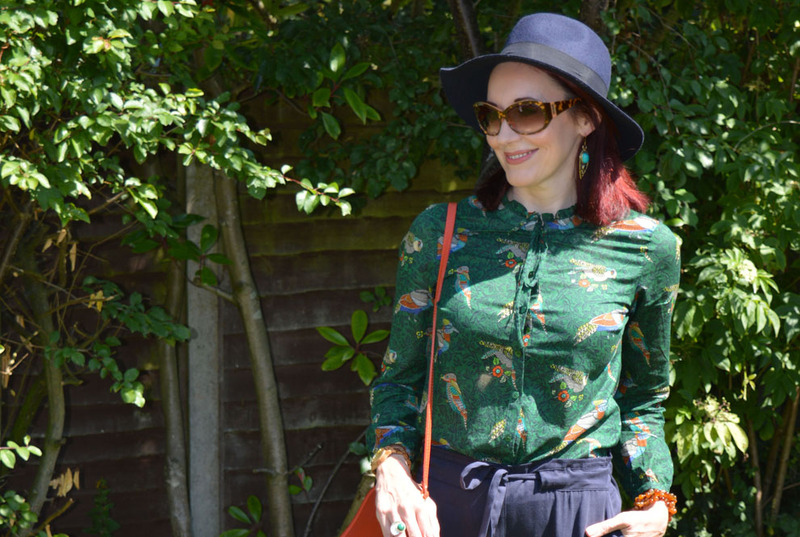 The bird print blouse is so striking and unusual that I get compliments whenever I wear it…and best of all is that I’ll be wearing it all year round thanks to a few seasonal styling tweaks!